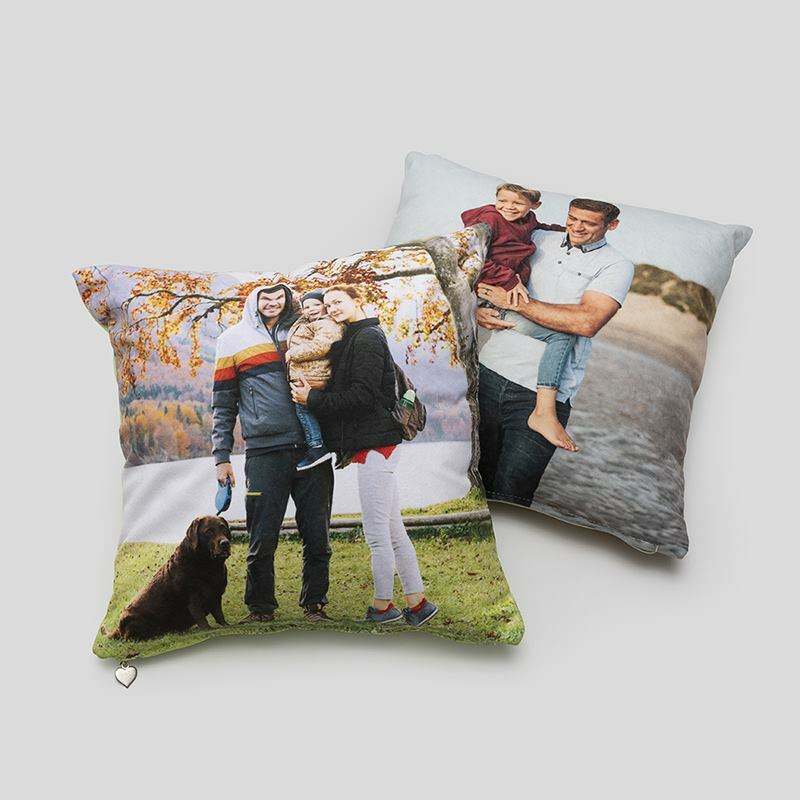 Design a set of personalised photo pillows for a fun and original addition to your bedding collection. Printed on both sides directly onto your choice of fabric, they're perfect to scatter on top of your bed, sofa or trendy window seat. Custom pillows are filled with plump, sumptuous padding and come in sets of two or four. These gorgeous scatter pillows custom printed with your photos make a gorgeous gift set for any style conscious person. Choose from two equally soft and showstopping fabrics - Suede Vision or Archway Brushed Twill - and create a gorgeous set of custom pillows to scatter on the bed. The cover is removable via a stylish heart zip and can easily be machine washed. The quality of product is absolutely amazing! I was beyond satisfied and impressed to see my design beautifully manufactured onto the pillows. I planned on giving both pillows within the set to my mother for mothers day... But I secretly loved it that much I gave her one and kept the other for myself (I just couldn't bring myself to part with it). Thank you so much! Our pair of pillows with the tweedy cover were exactly as expected in terms of quality for the price. They were speedily delivered and just as described. I also appreciated that the website allowed the massive file sizes needed to get a high quality print. My son's great gran only comes alive for him these days, and it's nice to be able to have such large, cuddly, beautiful products with his image on them in her care home room. I am optimistic that they will hold up if they are ever washed. Ordered some photo-cushions, and received them 5 days later in Australia. Top quality, really easy process, will definitely order some more stuff in the future. This fabric has a distinctive twill weave that adds character and traditional charm. The surface is brushed, giving it a soft, smooth texture. The weave is visible through your designs and really brings out a retro vibe. Suede Vision is soft and smooth with a matte face. As well as being trendy and sleek, it's also fire rated, so is super safe to use in domestic settings. The fabric is a mock suede, so it glides against the skin effortlessly. Care: Remove the covers from your photo pillows and machine wash. Archway Brushed Twill can be washed at 30°c, but we recommend a cold wash only for Suede Vision. Both fabrics are tumble dry safe and can be hung out to dry. In order to keep the surface of Suede Vision soft and smooth, give it a gentle brush once dry. Whether it's a treat for yourself or a gorgeous gift set for friends and relatives, click start design above and have fun creating your own home furnishing. Your designs are printed directly onto your chosen fabric, using a specialist technique. The inks are fused deep into the fibres, creating a long-lasting print that won't crack or peel off, unlike other methods of printing that print on top of the fabric. The zip is sewn in, where a metal heart charm is added for an extra touch of glamour. Your custom pillows are stuffed with a plump, thick cushion pad, and our expert seamstresses hand sew the fabric together for an excellent finish. When designing your photo pillows, please notice the bleed area, marked out in red. This indicates the area of fabric to be used to sew the hems. Any design placed within the bleed area may be lost in the hemming, so keep important features away from the edges to make sure. You get to print your photos on both sides of these handmade custom pillows, so choose a contrasting design to essentially get two for the price one, or keep the style uniformed and print the same or similar photo. Perfect for filling any gap in your interior decoration, these custom pillows can be designed to complement your existing decor. Treat your home to a mini makeover and adorn your sofa or bed with something truly original. Can't decide which photo to print? Don't worry, as you can create a photo collage featuring all your favourite pictures. Pictures of friends, family and beloved pets are always a favourite choice, for obvious reasons. Or, you can create a patchwork style collage using pictures of different patterns and textures. As a totally original wedding gift, design a set of cushions that the happy couple can cherish forever. Printed with their new shared surname, nicknames or photos from throughout their relationship, this is a memorable present that will be unlike anything else they receive.